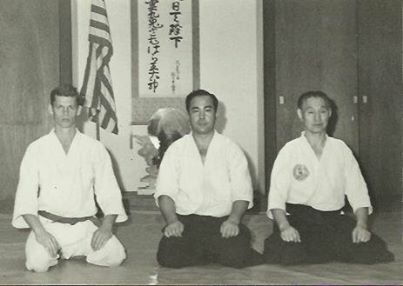 Yoshimitsu Yamada was born in Tokyo, Japan in 1938, entered Aikikai Hombu Dojo as an uchi-deshi in 1956 and was dispatched to New York to aid the development of Aikido in the United States in 1964, the year that I was born. I last saw him in 2011 in Honolulu, Hawaii, at the 50th anniversary celebration of Aikido Founder Morihei Ueshiba’s 1961 visit to Hawaii. 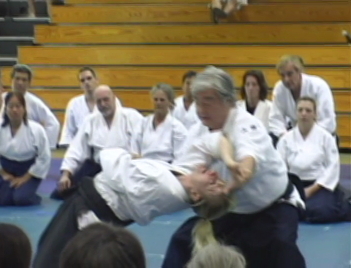 He didn’t remember me then, but we had met previously at the New York Aikikai in 1982. Of course, he had no idea who I was then, either, but I had wandered into the New York Aikikai to ask about going to Japan to study Aikido at Aikikai Hombu Dojo. I was eighteen years old when I went to Hombu with him that fall, the same age that Yoshimitsu Yamada was when he began studying Aikido. 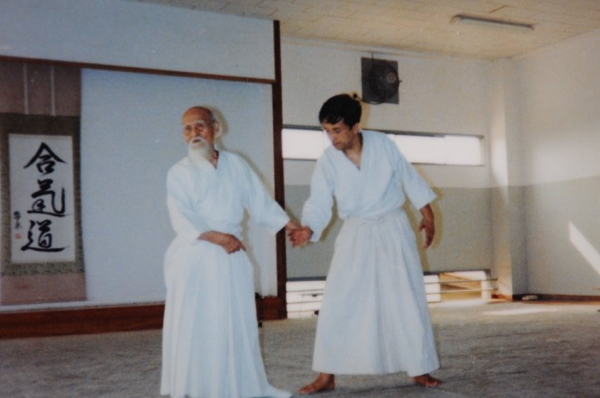 At the time I had been studying Aikido with Frank Hreha and Mitsugi Saotome of the Aikido Schools of Ueshiba, with whom he had been having an ongoing, and sometimes acrimonious, dispute. I was blissfully unaware of the background drama, and he never mentioned it, instead offering to take me to Japan with him on his next trip. Despite having met me scant minutes before, he immediately set me up with his travel agent, who arranged a visa with Yamada Sensei’s mother as my guarantor. When we got to Japan he set me up with a room in a small Minshuku (a boarding house) in Wakamatsu-cho, and then took me to help get enrolled at the dojo. After which….I didn’t see him for many years. I eventually returned to the United States, and continued to train with Mitsugi Saotome and ASU – but I will always remember his kindness to an unknown fifth-kyu walking in off the street with extreme gratitude. This is the first part of an interview that originally appeared in the April 2009 issue of Gekkan Hiden (月刊秘伝 / “Secret Teachings Monthly”), a well known martial arts magazine in Japan. This interview was also published in a collection of interviews with students of the Founder published in Japanese as 開祖の横顔 (“Profiles of the Founder”) in 2009. There was a short introduction to this work in the article “Morihei Ueshiba – Profiles of the Founder“. A number of English translations of interviews from that collection appeared have appeared previously – Nobuyoshi Tamura Sensei (Part 1 | Part 2), Hiroshi Isoyama Sensei (Part 1 | Part 2), Shigenobu Okumura Sensei (Part 1 | Part 2), Nobuyuki Watanabe Sensei (Part 1 | Part 2), and Masatake Fujita Sensei (Part 1 | Part 2). Q: I’ve heard that Tadashi Abe (阿部正) Shihan, who appears in many anecdotes, is your cousin? A: He’s not my cousin, he’s my uncle! It’s a little bit confusing, but my father lost his parents when he was seven years old and was placed in the custody of the Abe family, where they were raised as brothers separated in age. So to me he was like an uncle or an older brother. Q: I’ve heard that he had an extremely severe personality, what was he really like? A: He had a severe temperament! But he didn’t mean to hurt anybody, he just had a one track mind. Q: Is there something that you especially remember? A: When my uncle challenged Tohei (Koichi). A: I’m sure that it was my second or third year of junior high school. My uncle was training with the Waseda wrestling club, so he went to take on Tohei Sensei wearing a maroon colored Waseda jersey. Q: That’s incredible, what happened? A: Oh, it was completely beyond him. 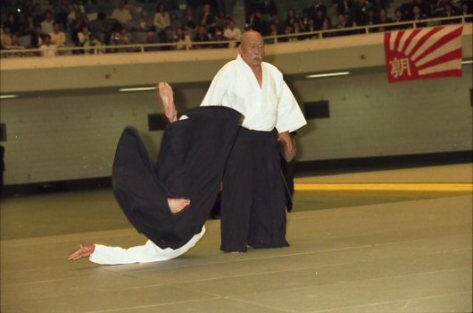 He circled him wrestling style and tried a low tackle, but Tohei Sensei distanced himself and wasn’t there. As we were leaving I said “Huh, I thought you were the strongest, but I was wrong!” and he got really angry. The next day he made me put on Kendo armor and beat me on the head severely! (laughing) It wasn’t very mature, but he had that kind of a naivety. So one could say that he challenged Tohei Sensei, or perhaps it was that he presumed upon a Sempai who knew what his temperament was like and went along with him. Q: Did you start Aikido because of Abe Sensei? A: Indirectly. Actually, I never saw my uncle do Aikido, I never saw him do anything except that incident with the wrestling. Q: So how did you come to know about Aikido? 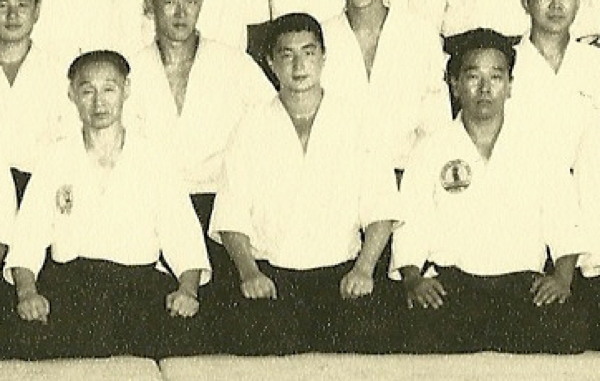 A: My uncle’s father did quite a bit of business in Osaka, and he loved Budo. So he would invite O-Sensei and Tempu Nakamura to his home to speak with him and give demonstrations of their arts. The first time that I ever saw O-Sensei was one of those times. Of course, I was a child, so I wasn’t formally called in to see, I just stole a peek from a back corner. Q: Do you remember what it was like? A: I was a child, so I don’t remember what they were doing at all. I just remember something like the sensation of a black whirlwind dancing on the tatami. At that time O-Sensei would wear a black kimono while giving demonstrations, so I think that’s why I had that impression. However, although I didn’t understand what he was doing, I thought “Some day I will learn that”. Q: Even though you didn’t understand what was happening? A: Yes, that’s right. But I clearly remember thinking completely naturally “I will learn that soon”. That’s why when I started I became an uchi-deshi right away. A: I took an introduction with me when I went to Hombu and said “From today Onegaishimasu” (今日からお願いします). Q: That’s also….incredible! (laughing) Who was there when you started? 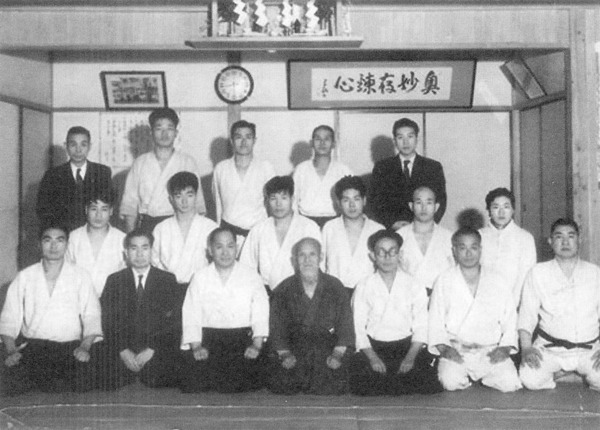 A: Sadateru Arikawa (有川定輝) Sensei was at the top of the list, then Nobuyoshi Tamura (田村信喜) Sensei and Masamichi Noro (野呂昌道) Sensei. It was a wooden building that really felt like a Budo dojo. There was no office, so when visitors or people wishing to enroll came to the entrance we would step and and deal with them. Q: I’ve heard that Arikawa Sensei’s classes were extremely severe. Q: That’s even more than I’d heard of before! What was life like for the uchi-deshi of that time? A: We’d wake up at 6 a.m. and clean the dojo inside and out. But Arikawa Sensei wouldn’t do any cleaning. (laughing) Noro Sensei, Tamura Sensei and I would do it. I was the lowest one in our group so I would clean the toilets. Q: So it really felt like a Dojo. Q: What was training with the Founder like? A: At that time most of the instruction was already being done by Kisshomaru Sensei so there was no particular time that O-Sensei was teaching. However, O-Sensei really wanted to teach. Even though he didn’t have anything to do there, he would walk through the hallway between the main room and the dojo while we were training and peek inside. He’d want someone to speak to him. That is, we couldn’t say “Sensei, please teach us”, so we would just keep quiet and train. A: Then, when we were unable to do something, he would step inside. At first he would just stand in the doorway and watch. When that happened we had to say something, so we would say “O-Sensei, please come in”. He’d enter with a happy look on his face, while saying “No, no, never mind this old man”. (laughing) It feels a little disrespectful to say this, but he was kind of cute, that’s all I can say. Q: (laughing) I can almost imagine it. He wasn’t frightening? A: Not at all. In our time he really seemed like a kindly old man. But he could talk for a long time. During the cold days of winter the north wind would whoosh through the Dojo, and it was so cold that everybody would just pretend to pay attention. Q: What was it like to actually take his hand? A: The lectures went on for so long that it seemed like my turn would never come, and once something was finally applied to me I would be thrown before I knew what was happening. It felt as if you were being thrown in a flash, with no chance for reluctance or response, it was really a mysterious feeling. Q: So there was no explanation of technique? A: None, none. There was difficult talk from things like the Kojiki, and then he’d throw you in an instant “Like this!”. 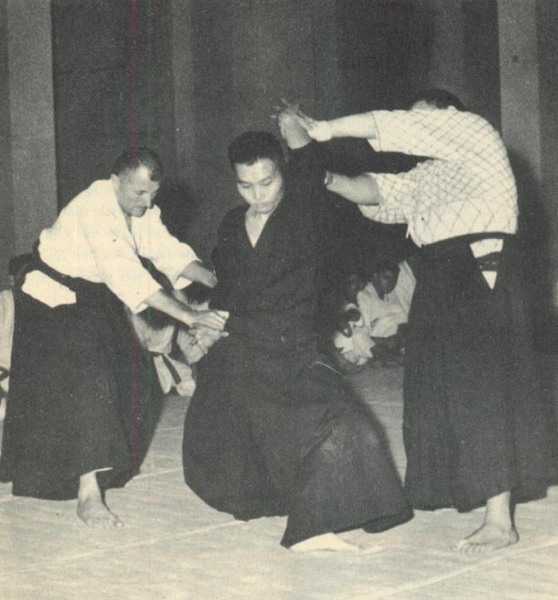 However, he would often say “Aikido changes each and every day”. Q: Do you have any memories of being scolded? A: If we started training with Irimi-nage we would get scolded. First, we would have to hold them down firmly with Shiho-nage. Then, there was one time that I got scolded after swinging a Bokken in the Dojo. “Why do you think I made Aikido!” he said, even though he himself would swing a sword, and he would give explanations while holding a sword. Now that time has passed I have come to understand. Foreigners want to pick up swords right away, they like it and enjoy it. That’s why I haven’t dared to teach the sword. I think that if you have practiced Aikido for many years and have come to hold the sword naturally then it is okay. However, if you just try to put on airs with the sword then everything will go wrong. I think that perhaps O-Sensei thought the same way. He would say “It’s ten years too soon!”. Q: So it was different in different periods? A: That’s probably true. However, we had a good time at the Dojo. Tohei Sensei and Kisaburo Osawa (大澤喜三郎) Sensei were there, and there were both fascinating. Q: What was Tohei Sensei like at that time? A: He had just come back from Hawaii, and he was really handsome. His teaching was logical and he drank enough Sake to shower in, he was really a man’s man. Q: I often hear Osawa Sensei’s name, what kind of a person was he? A: In one word, he was the mediator. When there was something that we just couldn’t tell Doshu, or some small disagreement, he would come and advise – he would never make an empty promise. When he said “I understand” then he would always follow through with what he said, that was really incredible. Q: Was he a little different from Tohei Sensei? A: Yes, Tohei Sensei was the feudal lord type. People were naturally attracted to his character. Osawa Sensei was more like a commoner, the type of boss that grasps the subtleties of people immediately. He had a really huge presence. Q: Who was the Sempai that taught you the most? A: That would be Kisshomaru Doshu. For that reason my Aikido is extremely basic. Into that I put the best parts of the various Sempai and included them as I could best understand them. However, at that time there was no feeling that one was being taught, you had to steal it.